You have added Lilac and Cream Boho Embroidered Pattern Dress into shopping cart. FINAL SALE. This cute boho summer dress features a unique combination of cream and lilac together. The Lilac and Cream Boho Embroidered Pattern Dress is fully lined, except at the top back. The features a multi-colored cream, lilac, burgundy, red, orange and black pattern design throughout. The banded empire waist gives way to the flowy cream chiffon skirt. A panel of cream lace throughout the skirt adds contrast to this flirty look. The adjustable spaghetti straps allow you to control the fit of this dress. The elasticized ruched back of the dress expands to fit your shape. The Lilac and Cream Boho Embroidered Pattern Dress is perfect to wear to any concert or summer gathering. Pair it with flat beaded sandals for a casual day look. Or dress it up with wedges for a dinner with friends. Details: Fully lined. Adjustable spaghetti straps. 100% polyester. Contrast 1: 100% cotton. Contrast 2: 75% cotton, 25% nylon. Contrast 3: 100% rayon. Lining: 100% polyester. Hand wash cold. Do not bleach. Lay flat to dry. Small measurements: Length from top of bust to hemline: 29". Bust: 32". 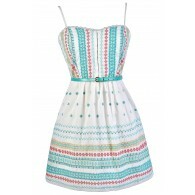 You have added Lilac and Cream Boho Embroidered Pattern Dress into Wishlist. You have added Lilac and Cream Boho Embroidered Pattern Dress for Stock Notification. 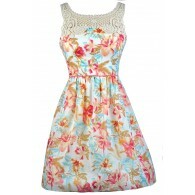 You have set Lilac and Cream Boho Embroidered Pattern Dress as a loved product. You have removed Lilac and Cream Boho Embroidered Pattern Dress as a loved product.